"Sampath Speaking" - the thoughts of an Insurer from Thiruvallikkeni: the heroes at work at Mohali, nay, not the Cricketers ... !!! the heroes at work at Mohali, nay, not the Cricketers ... !!! The other day, returning from Office, took a right turn from Wallajah road, only to find some Policemen and blocked road – a World Cup T20 match was on – a match involving women’s team – not much of a crowd though. -and one thing that hits on face, that most of them, the security staff, are not Police – and seemingly unprofessional at that. It was not that long ago that New Zealand were seen as dark horses at nearly every world tournament. In this one though, the Kiwis are flying high – looking all champions. A victory against Pakistan in Mohali will take them to a second semi-final at a global event in as many years. Shahid Afridi and his men, no matter how much their erratic form hints otherwise, are no pushovers. Pakistan's reading of the Kolkata pitch was incorrect, although they couldn't help the rain that arrived later, and lent it just enough moisture for the ball to grip and turn. Mohali is a great venue. On 18th Mar - Suzie Bates' swift 60-ball 82 and her 104-run partnership with Sophie Devine for the second wicket set the base for New Zealand Women's massive 93-run win over Ireland Women. Memory would take us back immediately to that day in Mar 2011, when India beat Pakistan in the Semi finals of World Cup and the Nation rejoiced. There have been thousands of matches before this but ODI 3147 at Mohali was a supercharged one. The entire Nation stopped work, streets were empty – family and friends reunion everywhere. People were talking to each others, phones kept ringing – the only topic INDIA -- read cricket…. At 11 pm in the night, most children were awake so also were parents. People’s joy and celebrations were reminiscent of 25th June 1983 – when the whole Nation erupted. Mohali, is also known as SahibzadaAjit Singh Nagar (SAS Nagar), lying adjacent to the city of Chandigarh. Named after the eldest son of Guru Gobind Singh it is a popular commercial hub. After the partition of India in 1947, the former British province of Punjab was split between east Punjab in India and west Punjab in Pakistan. Mohali was conceived after the trifurcation of Punjab and its capital Chandigarh becoming a Union Territory in late 1960s. If you are going to the ground today for the World T20 match and the police is trying to stop you from reaching your favourite cricketers for autographs, look closely and possibly ask them where DSP (Traffic) Rajpal Singh or SP (City) Gagan Ajit Singh are. Ask for their autographs too. Rajpal is a former India hockey captain, Gagan Ajit a former striker. Both are Arjuna Award winners, but they now work full time with Punjab Police. There has been a longish tradition of India hockey players or athletes looking after the security of cricketers at the PCA Stadium in Mohali. The thing is, nobody knows they are being looked after by legends in their own rights. Nobody in the crowd knows, cricketers don't know - although it is hard to expect them to scan every cop's face - and sometimes even the other cops don't know that one or two of them has represented India at hockey. Even if you have interest in hockey, it is hard to tell with Sikh players when they are not in gear: they go from patka (bandana) to turban, and the beard is not always tied when they are not playing. 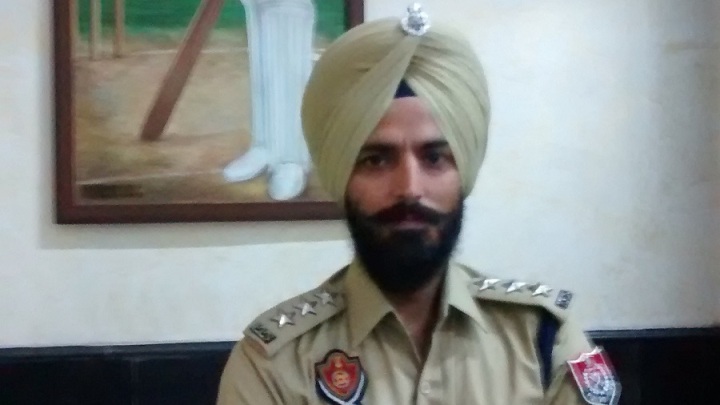 Punjab Police is a big employer of sportspeople. It's only GS Sandhu, the CEO of PCA, who was a decathlete himself and also a vice-president of Indian Hockey Federation, who recognises them at the stadium, among a sea of Punjab Police employees posted there for international and IPL matches. In 1999, during an India-Pakistan ODI he saw the legendary Pargat Singh here. He asked Pargat what he was doing here, and Pargat said he was on duty. Sandhu was surprised. Sandhu was the manager of the Indian hockey team when Pargat took them to Australia in 1991 for Tests and Olympics qualifiers. Pargat, considered one of the best defenders in the world at his time, went on to captain India at the 1992 Olympics in Barcelona and in Atlanta in 1996. Sometime back, Sandhu spotted Sunita Rani here. She has won an Asian gold in 1500m, and also holds the national record in 1500m. She has won an Arjuna Award and a Padma Shri. She too ensured the players' and crowds' safety without anybody recognising her. Rajpal, 32, has to wake up at 6.30am every day to play his hockey. He is not a part of the national team, which means he has to be on duty just like any other policeman. That, from 6.30am before his duty hours, is the only hockey Rajpal gets to play. The IPL-style Hockey India League doesn't hire players over 30. Rajpal has done a few IPL games here, and is now posted for the World T20 too. He doesn't feel bad that nobody recognises him. He knows hockey is not that popular a sport in India anymore nor is he on TV in the IPL-style league. "Anyway people don't expect a player to be doing duty in uniform," he says. "It is not easy to recognise." Nor does Rajpal grudge that he has to look after the safety of the cricketers. "I am not doing this as a former India captain," he says. "I am doing this is a policeman. I am a hockey player from 6.30am to 8.30am." He wants to continue being that hockey player in the morning for as long as his fitness can hold. The pride in his job shows in Rajpal. He didn't get an honorary post like, say, Harbhajan Singh, the cricketer, did. He applied for it, went through proper training and exams, and then made it as a policeman. So google these names, check their images, go up to them. Do selfies. Tweet them. So that the next time there is a cricket match in Mohali, Sandhu shouldn't be the only one recognising them.